Going Global for Wild Salmon! 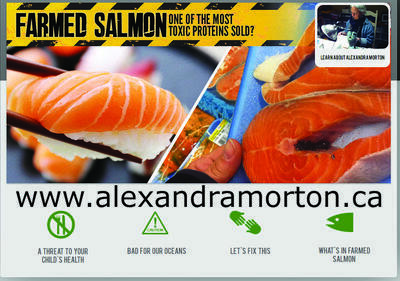 Alexandra Morton's new website reveals what we can do about the multiple threats to our health & oceans from farmed salmon. Please visit it to help spread the word! My personal fight to protect life in the waters around my home in a remote archipelago of the BC coast has stretched on for several decades. What began as a letter-writing campaign on behalf of fishermen neighbours (who lost their fishing grounds as a result of fish farm industry activity), became ten years of sea lice research, then a decade of activism, involvement in lawsuits, and virus tracking. Today, I am excited to be launching a website that brings together all that I have learned into one site. I hope to educate and inform people on what happens to their bodies, our children and our world, when they buy and consume a piece of farmed salmon. I also want to let you know what you can do to protect yourselves and our oceans. I am writing to ask for your help. Please visit my website: www.alexandramorton.ca. By doing so, you will help build a strong pathway to this site through the ether-world of the internet. The single greatest thing I have learned is that whether in BC, Chile, the UK, Norway or elsewhere no one can fight this aggressive Norwegian industry single-handedly. We can feed ourselves in a much better way, but first the dirty, wasteful ways have to be shown the door. So please visit www.alexandramorton.ca and help power the search engines that will take our experience global. I am humbled by your ongoing donations and support. Thank you all for sticking with me on this. I can see light at the end of this tunnel, but it continues a very tough fight.